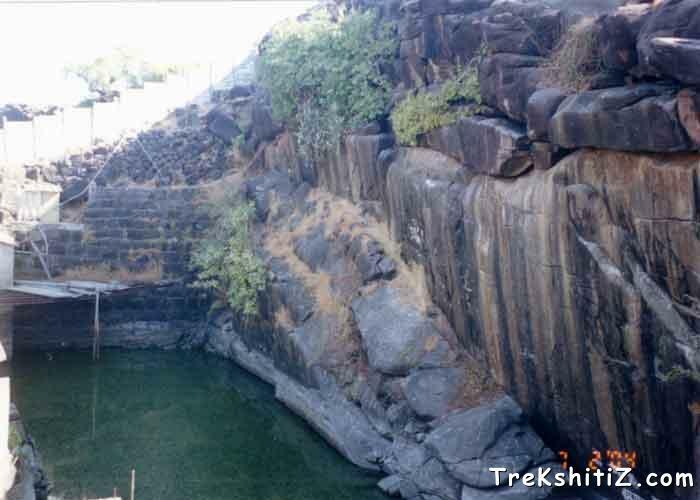 Khanderi and Underi are the forts built on two Islands near Thal, very near to Alibaug. The forts still stand proud in the Arabian Sea as they stood against the British and the Siddi in 17th century, and their walls are still intact. We can see the iron canons with cart wheels on Khanderi, which are rarely found in Maharashtra. Shivaji Maharaj selected the island of Khanderi to fortify it to keep a check on the British trade route to Mumbai and northward ports. He tried building the fort in 1672, but the British were sceptical and tried to siege the fort. The Marathas retreated, only to return back in 1679. Under the leadership of Maynak Bhandari, 150 men were garrisoned on Khanderi to complete the fortification. The English warned the Marathas, who did not pay heed to them. The Marathas continued their work without hindrance. The British then deputed their warships to block the supplies to the Marathas and stop their work. The Marathas till then had improvised a lot in their naval strategy, and deployed shallow vessels that could travel in low tide. Daulat Khan, another brave naval officer of Shivaji, defended the British from Khubladha fort of Thal and dispatched the supplies in the small boats during low tide, when huge British ships could not sail. Finally, Khanderi was completed and the British signed a truce with Marathas in 1680. On 8th March 1701, Siddi Yakut Khan attacked Khanderi, but had to retreat. In 1718, the British attacked this fort with a big fleet of warships. Mankoji Suryavanshi defended the fort with 500 men for almost a month, due to which the British had to retreat back. In 1814, the Peshwas took over the fort from Angres, who got it back in 1817. It went into the hands of the British in 1818. To the right side of the jetty is a wooden temple, where a huge stone is worshipped as Vetala or the spirit. The folklore tells that the stone grows in size every year. There is a festival each year during Holi when pilgrims gather here for worship. There are around 16 bastions on the fort, and we can have a look as we walk on the walls of the fort. There are couple of bastions where we find the canons. These are provided with stairs at regular intervals to descend inside the fort. Since the fort was under the custody of Mumbai Port Trust since the British rule, a lighthouse was built here and a helipad is also installed. Below the helipad there is a small door in the walls which takes us outside on the beach, from where we can have a good look of the fort walls. The lighthouse was built in 1867 and is functional since then. It is about 25 m high, and a good place to have view of the fort completely and the surrounding area. Once we start from the right side on the Jetty and complete our round, we again come to the front where we can see an amazing rock. When struck with another stone, it creates a noise like a metal vessel and is very unique thing. Thal town is located at about 8 km north of Alibaug, and the diversion to Thal is 4 km away from Alibaug on Alibaug Revas road. ST buses ply regularly between Alibaug and Thal. We can hire small boats from Thal beach, owned by local fishermen who take us to the fort. Khanderi is located bit far from the beach, and can be visited irrespective of high or low tide as it has a jetty. Since Underi has no jetty, one can visit it only during low tide. There is a method to find the timings for low and high tides. High tide timings can be taken from Hindu Panchang by multiplying the date by �. For example, if it is the 4th day of the month (Chaturthi), then (� x 4) gives 3. This indicates that the high tide will be at 3 am and 3 pm. Low tide will occur 6 hours after high tide, hence the low tide timings would be 9 am and 9 pm. The fishermen might sometimes demand doubled costs, and we need to bargain with them. Also, most of the fishermen leave for fishing early morning, by 6 am. Hence we need to inquire locally about the timings. Alibaug and Thal have resorts and restaurants. Packed lunch recommended. Alibaug and Thal have resorts and restaurants. One can plan a combined trip to visit Alibaug, Khanderi, Underi, Khubladha and Kihim beach for 2-3 days.